Space clearing can also be used on ourselves, whenever we need to reconnect with our center….. our own inner sacred space. We all have tools. We just need to remember to use them when we need them most!! Essential oils – Preferably young living or Doterra – cold pressed, organic oils. Dab; diffuse; inhale; bath; or brush through your aura as needed throughout your day. Crystals All and any you resonate with. High vibrational. Lemurian; Herkimer diamond; Smokey quartz; labrodorite; blue lace agate; celistite; shungite; ocean jasper, rose quartz…..just to name a few favorites. Candles – beautiful, one you love that is a special purchase, a gift for yourself. Ecococo candles; voluspa, or any other coconut wax base is ideal. Light your candle each time to set an intention, a wish! Sage sticks or palo santo – ancient smudging with smoke is used for the real heavy clearing…. It is like the sand paper that rubs away and eliminates all heavy, downward negativity. All fears; worries, blocks, stagnant sticky spots are dissolved with smudging. As too are any unwanted spirits or that ‘yucky feeling’….. the ‘ I don’t know, not quite right feeling’. Perfect to use in stagnant or dark unused corners throughout your home. Light your smudge or palo stick with this intention, and put it our in beach sand to care for her…. Tibetan or crystal singing bowls – sound has a measurable healing effect on the aura or energy of a room and ourselves. It changes our cell structure and memory, lifting it to a more positive energy vibration of wellness. A must for everyone. Plant Life – plants clean the air. They bring in life and energy, prosperity, abundance and vitality! Place a plant in every room. make sure it is lush and well cared for. Lights and Lamps – a lamp can be used to lift any corner of any room. These must have beauties raise the energy greatly in a home. Salt lamps, rose quartz lamps and celinite lamps are also perfect to increase energy and negative ions to clean the air. Have the incense ready to go in the morning – place incense with sand bowl near by your morning walk to the toilet or kettle! Keep essential oils in your bathroom, handbag or in the car. Inhale, rub into an area of the body or place a drop on your hand, rub, and brush through your aura to clear away unwanted emotions, or to invite the feeling or energy of the essential oil. Have a Tibetan bowl on the dinner table ready to gong as you set up for dinner. Or let the kids have a bang and a play! Keep smudge sticks or Palo Santo sticks on the coffee table to remind you to smudge when times are heavy or ‘thick’… stuck. Sleep with a few crystals near by. Have them on your office desk. Wear them as jewelry Or place them in your pocket or even your bra! space clearing and feng shui special…..
NOW is the time to reinvent and revisit our living spaces. To invite a new beginning to align with our souls journey…. 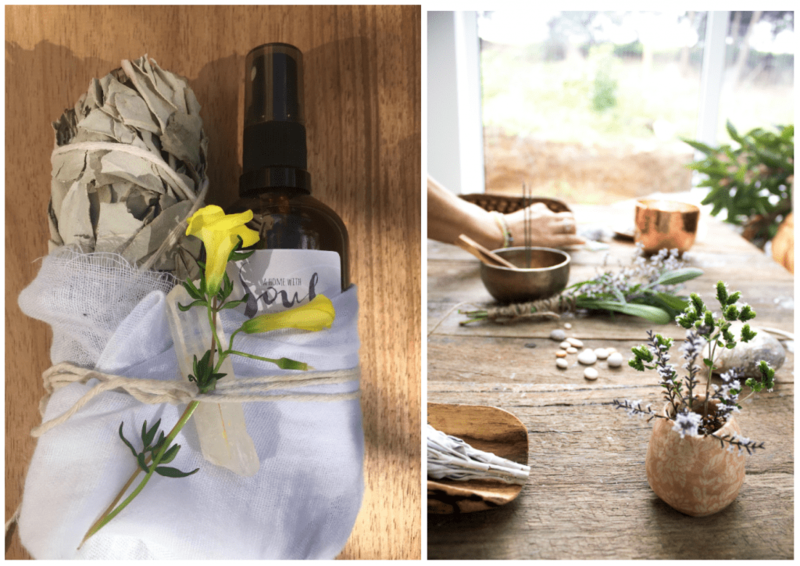 Take advantage of a home with soul’s Feng Shui or space clearing special consultation, to BALANCE, REJUVENATE and SUPPORT you and your living space NOW…. Home and phone consultations available at a special price of $180 – 2 hour consultation.